Since 2005 until April 2018, we operated up to 8 childcare homes in Swayambhu, which housed more than 300 (at it’s peak) vulnerable and rescued children. However, as we have been focusing solely on reintegration of children back with their families, relatives and communities since 2011, we began to phase out our childcare home model, as the best place for a child to develop is with their family (in line with the United Nations Convention on the Rights of a Child). In April 2018, the remaining 5 children living full-time in our care (whom were unable to be reintegrated) were placed in a foster care setting with families they have all known for many years, and are very happy! Thank you to all our supporters over the years for helping us reach this great milestone. We now continue to support more than 100 children and youth in our other 3 core programs (Reintegration, Next Steps Education Program (NSEP) & our Earthquake Response Program). Why did we have Childcare Homes? The majority of the Umbrella children come from rural backgrounds. The ten-year civil war left many orphaned and families in impoverished conditions as their livelihoods were lost. They were forced from their villages out of fear of the fighting or forced conscription, fleeing to Kathmandu and often ending up in corrupt homes. Parents in isolated rural villages were easy prey for child traffickers who promised that their children would get a good education in a private school and have a better life. In reality, they were dumped in unregistered ‘orphanages’ where the children were malnourished, not attending school, forced into domestic servitude, neglected and often abused. Umbrella rescued them with a view to reintegrating them with their families and communities of origin, and throughout this process we were committed to providing them with a safe and nurturing home environment, thus operating high quality childcare homes. Unfortunately, some of the children we originally rescued were orphans or their families have still not been able to be traced, so they grew up in our care until they finished school, before moving into our NSEP program. When the children were initially rescued and brought to our homes, they were in very poor condition – malnourished, dehydrated, suffering from skin infections and various ailments. Some were even suffering from more dangerous diseases including tapeworm, kidney problems, hepatitis and HIV. 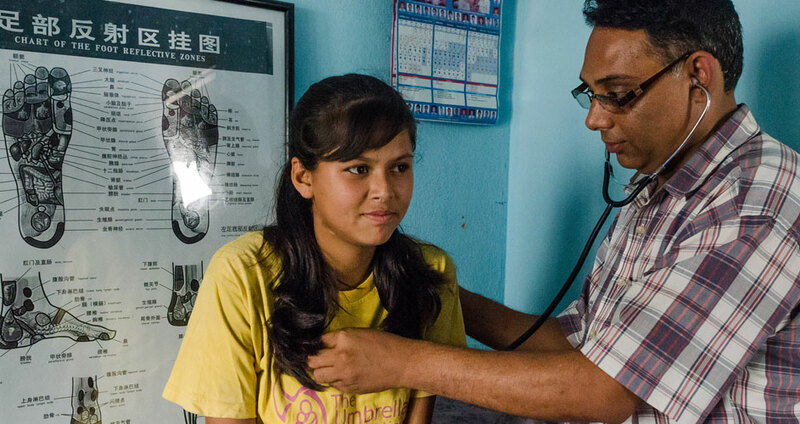 Umbrella has a health clinic (Paraplu) and employs a health assistant and doctor-on-call to give the children the medical attention they need. Coming from such difficult backgrounds, many develop social, emotional and behavioural problems and struggle with attachment and abandonment issues. This all comes as a result of the isolation felt in being separated from their family and the trauma experienced during their time in abusive ‘orphanages’. We have a Child Protection Team, including trained counsellors, who meet with the children and youth regularly in our dedicated counselling office (Paraplu) to discuss any problems and provide advice. At Umbrella, we do our utmost to repair the wounds, rebuild the broken bonds and reintegrate the children with their families in their home communities where feasible. Education is a high priority in Umbrella and we ensure that the children in our care receive the best possible schooling and support we can provide. 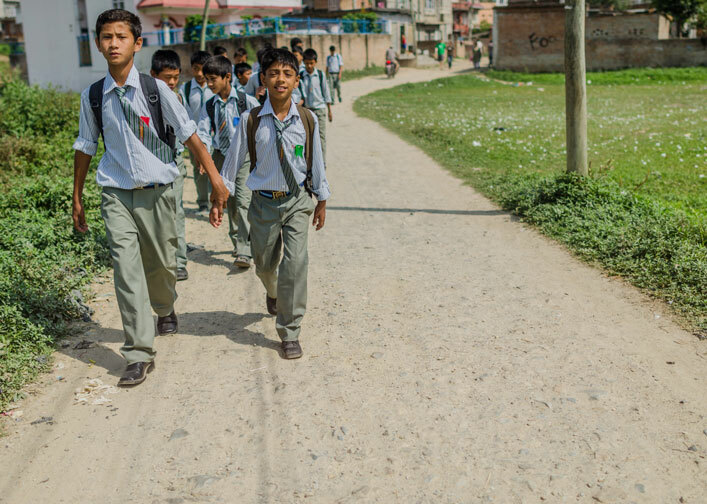 Child traffickers often prey on vulnerable rural families, promising ‘the best education in Kathmandu’. We dispel the illusion that quality education can only be found in the capital by only sending them to government schools similar to those available in their home districts. By offering the same opportunities their parents can provide, we have encouraged more families to take back their children. Education does not end when school is finished. Our Next Steps Education Programme (NSEP) provides them with the personal skills and further qualifications to become employable and responsible Nepali citizens.